Neoprene Espadrilles from beach to sidewalk and everywhere in between. Shoe selection for summer vacations can be tricky. ‘Sensible’ shoes make happy feet for a range of summer activities, but we also want chic in the same shoe, particularly women. Summer vacations require footwear for varied activities – shoes that can withstand getting wet, endure tough surfaces like sand, rocks, trails, steamy sidewalks of Manhattan, bike pedals and shoes with rubber soles for boats – all that and we want them to have style! Finally consumers have a choice that I think fits the bill. 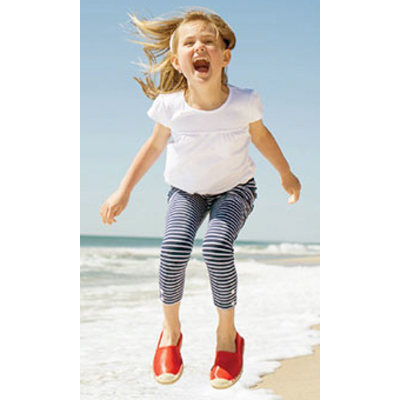 Sea Star Beachwear, a new company, makes water shoes that are dead ringers for the classic rope-soled espadrilles, but are made from fast-drying neoprene with durable rubber soles. They are fitted, very comfortable and look just like my favorite summer espadrilles. I love them. They will also look great with a pair of white pants and tunic top for drinks and dinner. They might very well be a shoe for every outing. Imagine! Packing one pair of shoes for a summer vacation! The company was founded by Libby Fitzgerald, a former marketing exec from Hermes, and Michael Leva, former creative director for C. Wonder. My niece Callie was wearing a white pair this weekend, looking very chic, and marketing them like mad because she loves them so much. Everyone was wild about them so I expect their online sales will have a spike. The Beachcombers can get soaking wet and be dry in 15 minutes. If they get dirty, just use a little liquid soap and rinse them in the sink and they’ll look brand new again. They are available for men, women and kids. They come in twelve solid colors, olive leopard (camouflage), blue leopard, and cobalt stripe. $78.00 per pair for adults, $68.00 for kids. Rumor has it that they are coming out with new, similarly chic ­­styles soon. We can’t wait. Why Are So Many People Angry In America? Thank you Nancy! Hope you have a great summer!! You are SO welcome! I am loving my 2 pairs and we are always happy to promote products we love. Good luck with the business.